Learn About Solar | Solar 101 | Where to Install | Should You Cut Down Trees to Improve Solar Panel Performance? Should you remove trees to improve solar panel performance? When we talk about the environmental benefits of solar power, we often talk about how installing a solar energy system can have the same effect on the environment as planting trees. Ironically, maximizing those solar benefits may involve cutting down a tree or two. It’s a difficult truth, but solar power and trees do not always get along. Branches and leaves can block sunlight from hitting your roof, which means your solar panels aren’t maximizing their electricity production potential. The good news is that most homeowners can usually get away with just trimming back a few branches. At most, you may need to remove one or two whole trees. Many homeowners hesitate to sacrifice trees for solar, because it doesn’t seem like an environmentally friendly or cost-effective solution. However, the net benefits of removing trees to install solar can be significant. According to American Forests, one tree stores about 0.5 metric tons of carbon dioxide (CO2) over its lifetime. Manufacturing a typical 5-kilowatt (kW) solar energy system produces about 10 metric tons of CO2, so the total CO2 emissions associated with removing one tree and installing a residential solar power system are roughly 10.5 metric tons. For the removal of the tree to make sense, the net CO2 reduction needs to exceed 10.5 metric tons. That seems like a lot at first, but your solar panels should generate at least 6,000 kilowatt-hours (kWh) of electricity per year for 25 years. This means that over the lifetime of your panels, you will produce about 150,000 kWh of emissions-free electricity. This translates to a whopping 103 metric tons of CO2 eliminated over the life of the panels! Subtracting the original 10.5 metric tons of CO2 emissions needed to install the panels from the 103 metric tons of CO2 benefits they will generate results in a net benefit of 92.5 metric tons of CO2 offsets. That’s the equivalent of planting more than 180 trees. While this isn’t good news for the tree in question, it is good news for the environment – and for your wallet. We recognize that there are other factors to be considered, too. First, you may have to pay to remove your tree. There are other less quantifiable factors to consider as well. The trees in question could house wildlife, shade your home during the summer, or provide aesthetic or other “quality of life” benefits. One of the newest options in solar, community solar, allows you to support solar without putting it on your own property. How these costs affect the equation is a function of your personal preferences and may or may not change the outcome. 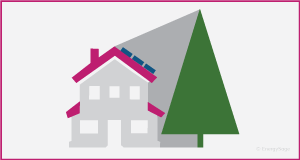 For most people, though, removing one or more trees to install solar panels is an excellent investment – from both a financial and an environmental standpoint – and shouldn’t stand in the way of installing a solar energy system on your home.